Relocating to another state can be frustrating when it comes to finding your favorite snacks, products and services. I've discovered this in the nearly four years of my new residency in Mississippi. You learn to adapt and try new favorites though, you still long for a taste of home. One of the features I love about SnackAisle.com is that they offer a variety of brands and unique snacks from all over the nation. If you're looking for all natural and organic snacks, SnackAisle.com is your company. Just check out the website to see all of the great products they offer! SnackAisle.com is the fastest growing distributor and retailer of all natural and organic snacks in New Hampshire. Our purpose is to serve those that appreciate high quality and superior taste in their snack foods. We strive to meet the needs of the individual, group, or organization that wants high quality, all natural, unique products in their daily diets. I recently contacted SnackAisle.com and asked if they would be willing to sponsor a review and/or giveaway for my Snack Mania quest. SnackAisle.com generously agreed and sent 3 unique and new (to my family!) snacks to try. Compared to store bought peanuts, these peanuts are much larger in size! Feridies Salted Peanuts are roasted in peanut oil and lightly salted. A weakness of mine is the love of salt and I don't mean adding too much salt to food that it's all you can taste. These peanuts are exactly as described, "lightly salted" and you can actually taste the peanuts themselves. Feridies Salted Peanuts comes in different flavors and sizes to suit your cravings and needs. These pretzels are made with whole wheat and filled with creamy peanut butter. My kids and I enjoyed them except we felt that these pretzels could use more peanut butter filling. I love giving my children healthier snacks and was proud to have them review these whole wheat pretzels with me. I adore trail mix snacks. There are so many varieties to choose from on the market today! 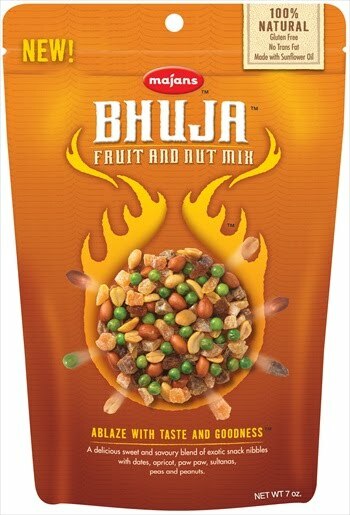 Bhuja Fruit & Nut Mix consists of dried dates, apricots, paw paw, sultanas, peas, and peanuts. I am unsure of the type of spices and seasonings used in this mix. The aroma reminds me of chili powder which I am not crazy about. However, I do like the taste of this mixture. The dried fruits give it an extra "zing" and there are several flavors and textures within one bag! BHUJA snacks come in six exciting flavor choices! Now that I have shared a bit about the company SnackAisle.com, how about a giveaway?! You will have the opportunity to gain several entries in this giveaway, please keep reading! Don't want to wait and see if you're the winner? You can purchase snacks from SnackAisle.com directly online with your credit card or paypal. Please visit SnackAisle.com for complete Shipping information. One of my readers will win a $25 Gift certificate to SnackAisle.com! MANDATORY ENTRY:Must be completed before any additional entries will count. Just share in a comment below something you would like to order from SnackAisle.com if you should win. (other than the products I reviewed). *Place an order with SnackAisle.com and earn 15 bonus entries! Disclaimer: I simply received a sample of products from SnackAisle.com and have posted my own, personal and unbiased opinions. I hold no responsibility between you and the company, and/or products you may purchase or receive from them. I would try the Good Health Peanut Butter Filled Pretzels! OOh, I would buy a box of stretch Island Farms Fruit leather! I LOVE that stuff! route 11 sweet potato chips sound yummy! The sweet potato chips sound yummy! I would get the Mrs. May's Pumpkin Crunch. I like the starving college student box! The Late July Organic Dark Chocolate Sandwich Cookies 8.2 oz sound so delicious! They support New Hampshire public television. I have always wanted to try Lucy's Cookies and Mrs. May's Ultimate Plus bars...to name a few! I am your google friend/follower! They help out the salvation army! I'd like the Terra Exotic Vegetable Chips Sweet Onion. The D.L. Jardine's Peach Salsa sounds outstanding. I have never tried Peach Salsa and if I win I will order this for sure! Thanks you so much for hosting this giveaway. I would like to try the Deep River Salt and Vinegar Chips. I found this on the bloggers group. Awesome blog and thank you for the giveaway! Would love love love to win this! I would get a case of New York Pizza flavored Pirate's Booty from Pirate Brands. Deep River Salt and Vinegar chips. I'd get the Mrs. May's Ultimate Plus Mango & Strawberry Bars. Vermont Common Cookie Buttons Peanut Butter 6 oz Box, anything with peanut butter can't be all bad. i would like to try the pretzel crisps. I also follow with google. I'd like to try the Bhuja Cracker Mix 7 oz Bag. I subscriber via google reader 1. I subscriber via google reader 2. I would order the Mrs. May's Cran-Blueberry Crunch. I would love to try the Mrs. May banana and blueberry bars! I would love to get the Feng Shui Nori Seaweed Rice Crackers! They support the Salvation Army. Would love to get the Stretch Island Assorted Fruit Leather - Box of 27. Those are so good and would keep us happy for awhile. Snack Aisle supports The Salvation Army. Snack Aile supports The Salvation Army. I'd order the Dr. Lucy's Cinnamon Thins. They are delicious! I'd have to get the Kettle Baked Potato Chips Hickory Honey BBQ flavor. The Pretzel Crisps Buffalo Wing would be tasty. 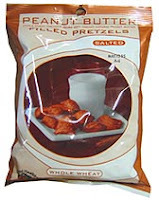 Good Health Peanut Butter Filled Pretzels look great!